England: whoever said the League Cup was boring? Just when you think you’ve seen it all in football, the sport continues to show that it has the capacity to surprise. In England’s Capital One Cup, the latest reincarnation of the League Cup, there has been no shortage of surprises throughout this season’s competition with a fair amount of controversy thrown in for good measure. After being derided as a “Mickey Mouse” cup over the years, one can argue that, in terms of excitement, the League Cup is actually far more interesting than its big brother, the FA Cup. The 2012-13 League Cup final will see Premier League side Swansea City, set to play in their first major English final (the Swans have ten Welsh Cup triumphs to their name), against fourth-tier side Bradford City who have already disposed of three Premier League clubs so far in this competition. Swansea City, who hail from Wales’ second city, will become the second Welsh team to reach the League Cup final in twelve months after their arch rivals Cardiff City were beaten by Liverpool in the 2011-12 edition. If Swansea can live up to their billing as heavy favourites then they will create history for Welsh football by becoming the first team from the country to win this particular competition (Cardiff won the FA Cup in 1927). The achievement of reaching the final for Swansea City is remarkable given that the club were only promoted to the Premier League just two years ago and under the management of Danish footballing legend Michael Laudrup have continued and expanded on a fine passing game played under his predecessors Roberto Martinez, Paulo Sousa and Brendan Rodgers. The Swans have knocked out of the competition, amongst others, defending cup holders Liverpool and European champions Chelsea. The latter game was laden with controversy after Chelsea’s Eden Hazard kicked out at a ballboy during the semi-final, second leg when trying to retrieve the ball in the last stages of the game, which was goalless on the night but stood 2-0 in Swansea’s favour. The ballboy, revealed as 17 year old Charlie Morgan, fell on top of the ball after a tussle with Hazard who subsequently aimed a kick whilst Morgan was lying on the ground. Hazard saw red, both in terms of anger and in the form of the card shown from the referee’s pocket, but went on to speak to Morgan after the game with both parties apologizing to each other in the aftermath. The incident almost overshadowed the fact that Swansea had successfully defended the 2-0 lead gained from the first leg at Stamford Bridge and will go to Wembley hoping to win their first piece of major silverware since their 2010-11 Championship Play-Off victory which guaranteed their promotion to the Premier League. Bradford City, a Premier League club as recently as 2001, have suffered a downward turn in fortunes since losing their top flight status. As well as three further relegations, the Valley Parade club were placed into administration in 2002. Nevertheless the spirit of the club has prevailed in tough times and the League Two table currently sees Bradford lying in tenth place, five points behind Northampton Town in the automatic promotion spots and just two points outside the Play-Off places. Their cup form has been nothing short of extraordinary, knocking out three Premier League clubs along the way. Penalties were needed in both the fourth round match against Wigan and the quarter-final tie against Arsenal before Bradford put the challenge of Aston Villa to bed by defeating the Birmingham based side 4-3 on aggregate. Should the Bantams win the trophy against Swansea on February 24th it will go down as one of the most remarkable cup triumphs of all time and would give the West Yorkshire club their first major cup win since they saw off Newcastle United in the 1911 FA Cup final. Anybody who bemoans the fact that none of the giants of the English game have reached the League Cup final really ought to remind themselves of what makes cup football so exciting in the first place. The chance for David to get one over Goliath is an essential part of knockout football. The fact that two clubs such as Swansea and Bradford are in the final should be celebrated as it gives other clubs the opportunity to dream that it could be them one day, especially in an age where money seems to be deemed more important than the silverware. Try telling that to two clubs whose trophy cabinets aren’t quite as full as they are at Liverpool, Manchester United and Chelsea, to name but three giants of the game. In this respect the League Cup tends to be more open than its counterpart, the FA Cup. Apart from Portsmouth FC’s triumph in 2008 and Manchester City’s in 2011, the FA Cup has been won by one of just four teams – Manchester United, Chelsea, Liverpool and Arsenal – every year since 1996. In the same period the likes of Leicester City (twice), Aston Villa, Tottenham Hotspur, Blackburn Rovers and Middlesbrough have all lifted the trophy as well as the traditional heavyweights of United, Liverpool and Chelsea (Arsenal, surprisingly, haven’t won the League Cup since 1993). Perhaps the fact that the League Cup concludes early in the new year provides motivation for many teams to win that first piece of silverware in any given season. 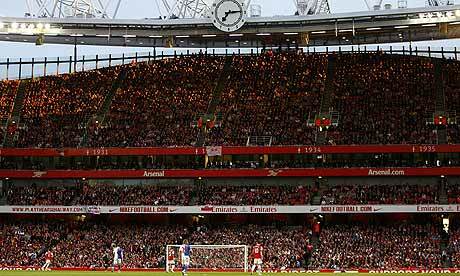 One thing for certain is that the League Cup deserves far more respect than it currently gets in the English game. Swansea and Bradford will no doubt provide one last highlight this season for a competition which is more interesting than its detractors realize. Didier Drogba will be leaving European champions Chelsea FC, it has been announced by the club today. The Ivorian, who signed for the West London club from Olympique Marseille in 2004-05, has scored 157 goals in 341 games for the Blues and won an assortment of medals including three English Premier League, four FA Cups, two League Cups, two FA Community Shields and the UEFA Champions League. The latter he won in Saturday’s final in which Drogba scored the equalizer in the last minute of normal time before going on to score the winning penalty in the shoot-out. It is understood that Drogba now seeks a fresh challenge elsewhere with China looking the most likely destination, having been linked strongly with Chinese Super League club Shanghai Shenhua. Who will get their hands on the UEFA Champions League trophy tonight? It may not be the “dream final” that the majority of the world’s football fans had craved but for tonight’s UEFA Champions League final opponents, FC Bayern München and Chelsea FC, the culmination of their own dream is so near. FC Bayern, playing in their home stadium tonight, can join the European elite by winning the competition for the fifth time to rank alongside great names such as Real Madrid CF, AC Milan and Liverpool FC. Chelsea, on the other hand, are desperate to claim a maiden title in this competition, especially as their only other final appearance ended in heartache when losing the 2008 final to Manchester United on penalties. FC Bayern’s European pedigree is without question. Their first continental title came in 1967 when defeating Scottish giants Glasgow Rangers in the Cup Winners’ Cup. The club’s heyday came in the mid-1970’s when the likes of Franz Beckenbauer, Gerd Müller and Sepp Maier helped the club win three European Cups in a row from 1974-76. The Münchener then became only the fourth club ever to have all three European titles in the trophy cabinet when defeating Girondins de Bordeaux in the 1996 UEFA Cup (the other clubs are Juventus FC, Ajax Amsterdam and FC Barcelona). The Bavarians’ most recent European triumph came in 2001 when a nervy UEFA Champions League final against Valencia CF had to be settled on penalties following a 1-1 draw in Milan’s San Siro stadium. Chelsea’s European success came on the back of two victories in the Cup Winners’ Cup but their regular participation in the UEFA Champions League over the last decade has ensured that they are now regarded as one of the game’s heavyweights despite the lack of success in the main competition. Chelsea’s first Cup Winners’ Cup triumph came in 1971 when they needed extra-time to defeat Real Madrid whilst the second title came at the hands of VfB Stuttgart in the penultimate version of that competition in 1998. 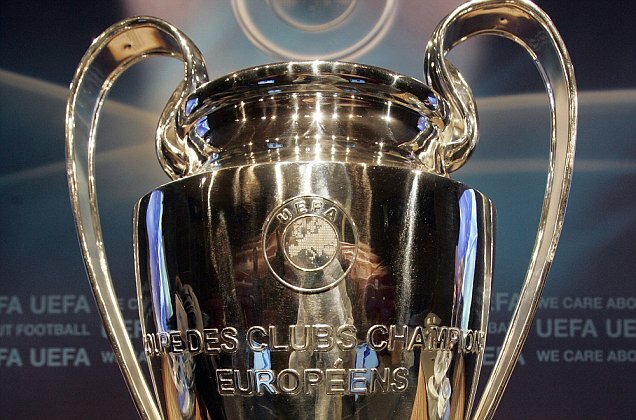 As well as the 2008 final, Chelsea have appeared in five Champions League semi-finals in the last decade but if the Stamford Bridge side are to finally get their hands on “Old Big Ears” then this is arguably their greatest opportunity to do so. FC Bayern have been one of the strongest teams in this season’s competition. The Germans finished top of what was arguably the toughest group in the tournament, finishing above Napoli SSC, Manchester City and Villarreal CF. After easily disposing of Swiss champions FC Basel 1893 in the Round of 16, Bayern reached the final by virtue of eliminating Olympique Marseille and Real Madrid in the latter stages. Chelsea, on the other hand, have often been on the back foot this season. The Londoners, following a Matchday 5 defeat away at Bayer 04 Leverkusen in the group stage, were on the cusp of elimination only for a Matchday 6 victory at home to Valencia CF to save their season. In the knockout rounds Chelsea saw a change of coach midway through their Round of 16 tie against Napoli SSC in which an Andre Villas-Boas led team crashed to a 3-1 first leg defeat but turned it around under the tutelage of Roberto di Matteo when winning the return fixture 4-1 at Stamford Bridge. The Italian has continued to work his magic with subsequent victories over SL Benfica in the quarter-finals and, most famously, over defending champions FC Barcelona in the semis. 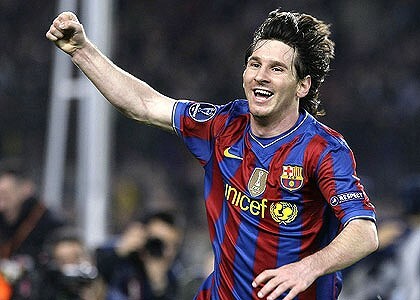 After claiming their places in the UEFA Champions League final both teams have completed their domestic campaigns. FC Bayern, normally the dominant force in the Bundesliga, had to be content with second place whilst watching Borussia Dortmund win their second consecutive championship. If that weren’t enough Dortmund thrashed Bayern 5-2 in last weekend’s German Cup final to leave the latter empty-handed domestically for a second successive year. Chelsea, following a poor start, did finish the English football season by claiming the FA Cup for the fourth time in six years when defeating Liverpool FC 2-1 in the final. However Chelsea could only finish sixth in the Premier League meaning that qualification for next season’s Champions League hinges on the result of tonight’s final. Win and Chelsea will displace Tottenham Hotspur as England’s fourth representative next season, but lose and Chelsea will end up in the Europa League. Much attention has been placed before tonight’s final on those who will be absent, most prominent among them being the Chelsea captain John Terry. Following a stupid off-the-ball attack on Barcelona’s Alexis Sánchez in the semi-final, Terry must sit it out tonight although UEFA have given him permission to lift the Champions League trophy as winning captain should Chelsea prove successful. Terry, along with Ramires, Raul Meireles and Branislav Ivanović, are all suspended for Chelsea whilst FC Bayern must play without the services of David Alaba, Luiz Gustavo and Holger Badstuber. Both sides, though, possess many potential match winners with FC Bayern, in particular, well equipped in this area. The Germans’ front five of Mario Gómez, Arjen Robben, Franck Ribéry, Thomas Müller and Toni Kroos have scored an impressive 94 goals between them this season. The Londoners’ main threat comes from Didier Drogba who has scored eight goals in as many cup finals in his time at Chelsea and was instrumental in his team’s success against Barcelona. Frank Lampard is also a dangerous player, whether it is from open play or from a set-piece, and he is desperate to bring the big one to Stamford Bridge as it is the only major trophy missing from his collection. If Fernando Torres is in one of his big game moods then there is every chance that he can also add to his collection of big game medals alongside those he has won with the Spanish national team. Although both sides have a very good chance to win the trophy it is FC Bayern who will go into the match as favourites due to their home advantage. Before their 2001 victory over Valencia, Bayern fans held up a banner which read “heute ist ein guter Tag, um Geschichte zu schreiben” (“Today is a good day to write history”). Will it be they who write another chapter into their glorious history or will Chelsea upset the odds once more and write an entirely new chapter of their own? It should prove to be a fascinating final…. 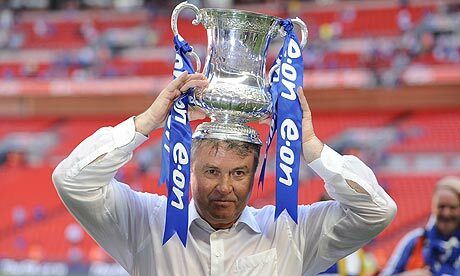 Guus Hiddink won the FA cup with Chelsea in 2009. Is he the right man for the Blues again? As Chelsea FC lick their wounds after ending the 2010-11 season empty handed, much speculation continues as to the identity of the club’s new coach following the departure of Carlo Ancelotti. Much of the current speculation is pointing towards Guus Hiddink which is far from surprising considering that he led the club to FA Cup success in a caretaker capacity during the 2008-09 season after “Big Phil” Scolari was sacked by the club’s owner Roman Abramovitch. However if the Russian billionaire is really desperate for a top coach to come to Stamford Bridge then he shouldn’t look much further than former Liverpool FC coach Rafael Benítez. Having owned Chelsea FC since 2003, Abramovitch has bought a galaxy of stars and hired and fired an assortment of managers in order to bring success to the west London club. This he has done with some aplomb having won three English Premier League titles, three FA Cups and two League Cups in that time. However there is a gaping hole in the Chelsea trophy cabinet which desperately needs filling and that can only be done with success in the UEFA Champions League. Having lost the 2007-08 final to English rivals Manchester United it is clear that Abramovitch really wants to win “Old Big Ears” and, in my opinion, Benítez would be the perfect choice. Rafael Benítez won the Champions League with Liverpool. Could he do the same with Chelsea FC? After all, the Spanish coach began life with his former club Liverpool FC by winning the 2004-05 UEFA Champions League with a far inferior squad to the one he could potentially inherit at Stamford Bridge. Benítez, on many occasions, got the better of his arch-nemesis José Mourinho whilst the latter was Chelsea boss and proved himself on many a famous European night at Anfield with victories gained over such illustrious clubs like Real Madrid, Internazionale and Juventus FC. If there was anything that “Rafa the Gaffer” was particularly good at it was his ability to prepare for Champions League matches and his record of two finals, a semi-final and a quarter-final in Europe’s premier club competition stands that theory to the test. But it isn’t just the European issue, important though that is, which should bring more attention to Benítez’s qualities as a coach. At Valencia CF he won two Spanish league championships in three years, as well as the 2003-04 UEFA Cup, and that team still remains the last one from outside the big two of Real Madrid and FC Barcelona to have triumphed in La Liga. Benítez also has FA Cup and European Super Cup triumphs to his name whilst at Liverpool and having run Manchester United close to the 2008-09 title it is clear that the Spaniard takes all challengers head on. If you take away the last 18 months of his time at Anfield his record is as good as most of the top coaches in Europe. One other important question to consider is this: if there is anyone who is going to bring out the best out of recent £50m Chelsea signing Fernando Torres, who flourished under Benítez while at Anfield, then surely that man is Benítez. Like him or loathe him there is no denying that José Mourinho is one of the finest and most astute football coaches in history after the self-styled “Special One” led Italian double winners Internazionale FC to their third European Cup against German Double winners FC Bayern München in an emotional night for the Milanese club in Madrid on Saturday becoming only the third coach after Ernst Happel and Ottmar Hitzfeld to win the competition with two different clubs. After the final his team flew home to Milan returning to a heroes’ reception at their legendary San Siro stadium but José himself stayed in Madrid to reveal football’s worst kept secret – that he would almost certainly be joining Spanish giants Real Madrid CF for the 2010-11 season. 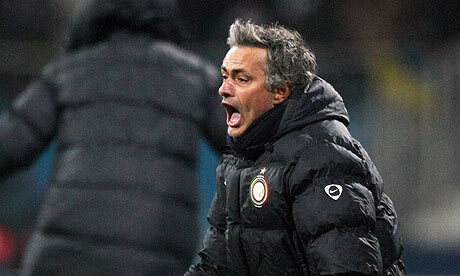 José Mourinho is very much a man who has courted controversy throughout his maverick coaching career. Having started life within football as an interpreter for Sir Bobby Robson whilst the former England coach plied his trade for Sporting Clube do Portugal, FC Porto and FC Barcelona Mourinho would then work with Robson’s successor Louis Van Gaal before fate dealt him his first proper coaching job at Portuguese giants SL Benfica. Sadly for Mourinho he lasted only nine games there before he took a modest provincial club União de Leiria to their best ever finish of fifth place in the 2001-02 season. After moving to FC Porto the beginning of the Mourinho legend was really starting to take off after he guided Os Dragões to two league titles, one Portuguese Cup, a UEFA Cup and UEFA Champions League glory. The manner of his departure from Porto upset some of the club’s supporters who thought that his cold and unemotional demeanour after the 2003-04 UEFA Champions League win over AS Monaco had soured his legacy somewhat. Nonetheless Mourinho then went to Stamford Bridge to guide a Chelsea FC side to their first league championship in fifty years before going on to win another five trophies with the Blues before club politics with billionaire chairman Roman Abramovich saw him discarded and move on in 2008-09 to Italian giants Internazionale FC with whom he has prospered immeasurably. The Internazionale side that he inherited was already a successful one having won the previous three Serie A titles prior to his arrival albeit the first of these titles was won in the courts after a match-fixing scandal and the second won in a championship minus giants Juventus FC, who’d been forcibly relegated to Serie B, and an AC Milan team who were deducted eight points in the 2006-07 season. In Mourinho’s first season at the San Siro Internazionale won the Serie A title by a ten point margin from both AC Milan and Juventus FC but were denied the Double having surprisingly lost to Sampdoria in the Coppa Italia semi-finals. In 2009-10 the Nerazzurri had to tough it out against AS Roma in the battle for lo Scudetto as Claudio Ranieri’s men recovered from a poor early-season start to take Inter all the way in the championship fight. However Mourinho was able to take his Inter team ahead in the title race with three matches to go and the club stayed there and won the league by just two points. The 18th league title for Internazionale ensured that they overtook Milan’s number of 17 Scudetti and also secured the Double, the first half of which had been secured a couple of weeks earlier when Inter defeated old adversaries AS Roma again in the Coppa Italia final. Now it was only Louis Van Gaal’s Treble-chasing FC Bayern team that stood in the way of Mourinho and history and the Special One had certainly done his homework on the opposition stifling the creativity of danger man Arjen Robben whilst playing the sort of combative, compact football which have become Mourinho’s hallmark. Diego Milito, a player who Mourinho had brought to the club from Genoa at the beginning of the 2009-10 season, was to play as fundamental a role for Inter as Pedro had for FC Barcelona in their Treble winning 2008-09 season. Milito scored the winner in the Coppa Italia final, the only goal of the game in Inter’s final Serie A game of the season against Siena to secure the league title and the two goals to win the UEFA Champions League for Inter, their first triumph in this tournament since 1964-65 in the old European Cup. The credit for the triumph has to go to Mourinho who has guided Inter into an elite group of clubs who have completed the Treble – domestic league and cup plus European Cup or UEFA Champions League – and has maintained a personal record of having not lost a home league game since February 23rd, 2002 (where his FC Porto team lost to Beira Mar) chalking up 136 games undefeated on home soil which is a truly remarkable record by anyone’s standards. Now it seems that José Mourinho will take over at Real Madrid CF with whom it has been reported he could start negotiations to take over Manuel Pellegrini as recently as Monday. Should he take over los Blancos one can only imagine just how much more unpopular he will become in Barcelona but that will be the sort of thing that the Special One will thrive on. Always up for a challenge Mourinho will want to become the man who takes Real Madrid to their tenth European Cup/UEFA Champions League victory and only from Monday will we be nearer knowing that the Real Deal will soon be signed and sealed for Mourinho. Ahead of the Champions League final in Madrid on Saturday both Internazionale FC and FC Bayern München had doubles (and trebles) on their mind as they finished their domestic league and cup seasons respectively. Inter needed to beat Siena to claim an 18th Scudetto which would allow the Nerazzurri to overtake city rivals AC Milan in league titles won and, although it was a narrow win, it proved to be so when Diego Milito scored just before the hour mark. Nearest title challengers AS Roma did what they had to do when defeating Chievo 2-0 with two goals just before half-time from Mirko Vučinić and Daniele de Rossi but it proved not to be enough for the Giallorossi who will rue their Matchday 35 defeat to Sampdoria as the one that lost them the title. 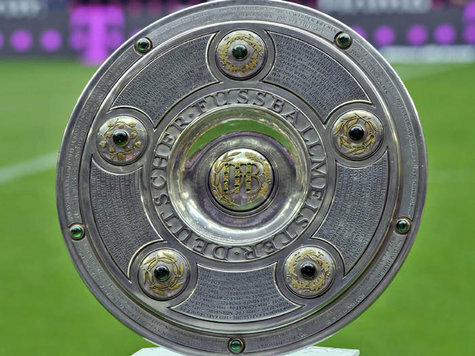 In Germany FC Bayern made easy work of the DFB Pokal final against Werder Bremen, who had been in very good form recently, by beating the northern side 4-0 to claim their 15th domestic cup triumph and their sixth Double in the last decade. Goals from Arjen Robben, Ivica Olić, Franck Ribéry and Bastien Schweinsteiger gave the Bavarian giants the cup defeating the defending holders in the process. Louis van Gaal’s men now face a Treble showdown with Inter in Madrid to see which one can create history by following another Treble winning side, FC Barcelona, as European champions. Other league champions crowned this weekend were Sparta Prague who won their first title since 2006-07 when beating FK Teplice 1-0 to pip nearest challengers Jablonec by a single point to seal the championship while in Poland Lech Poznań won their sixth Ekstraklasa title after defeating Zagłębie Lubin 2-0 which gave Lech their first league championship in seventeen years. In cup competitions Dundee United won only their second Scottish Cup after beating minnows Ross County 3-0 at Hampden Park (for a full report go to the “Away Days” section of the blog) whilst Zenit Saint Petersburg claimed the Russian Cup with a narrow 1-0 victory over Sibir Novosibirsk thanks to a penalty from Roman Shirokov.